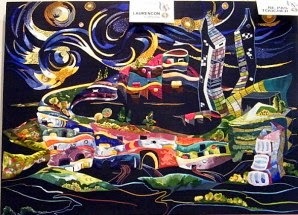 I go back to the embroidery school Zardosi for a 2 hour class on the framing of projects.. In truth it isn't really different from our usual way; i.e. first we ought to fix the top and the bottom of the piece with running stitches over the grosgrain ribbon and solidify it by stitching back with short back stitches. The main difference resides in the chosen method used to apply tension to the fabric, here there are thin strings sewed directly through the left and the right sides. A narrow hem assures the fabric to not tear up when the needle and the thin strings pass through. An extra tension is provided by rolling up the strings on a mobile wooden dowel. What we learn at Zardosi school isn't exactly the Indian way of framing. In India, the professional embroiderers frame the fabric with the Aari hook. Apparently the use of this tool assures a greater strength and avoids variations of tension on large projects. In India, many embroiderers work at the same time on the same project and they directly sit down on the floor. In this time of the year stands the competition of The Best Craftsman of France (Le meilleur ouvrier de France). This is a title of prestige which the artisans seek to obtain. The competition of The Best Craftsman of France exists in several traditional fields like Pastry Creating, Carpentry and... Embroidery. This year the competition’s theme is India. Consequently some professional embroiderers come to consult Shika (the Zardosi School's owner) with the purpose to be enlightened about the Indian traditional motifs, the specific colors and the techniques used with. 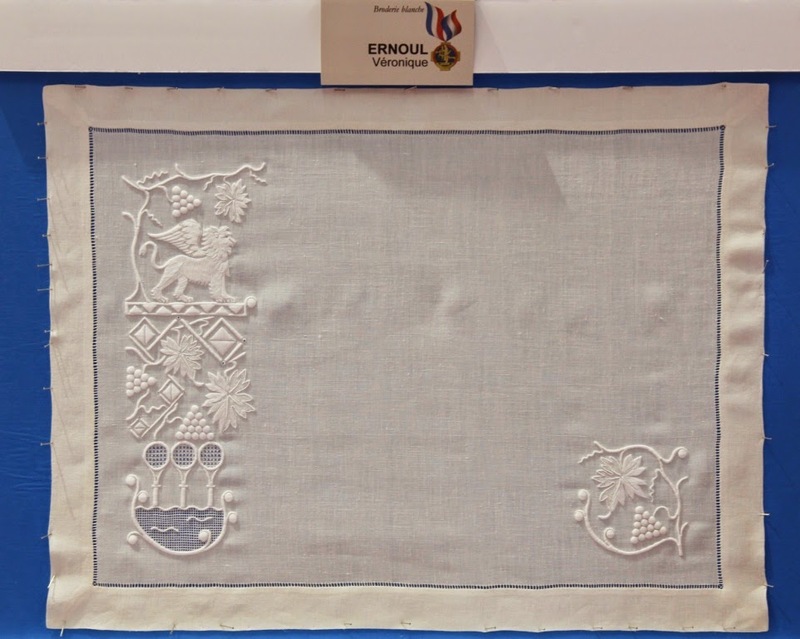 Of course in India, the stitching is done with the Aari hook but for the French competition the jury seems to prefer embroideries made with the Tambour Work occidental hook (crochet de Lunéville) which is a genuine French tool (the shapes of the two hooks are slightly different). With the French hook, the stitching is made on the reverse side of the fabric. On the contrary, with the Indian Aari hook the embroiderer always works on the right side of the project. Once the piece is finished, one ought to be a very clever juror to identify which of the two hooks has been used, because the two resulting chain stitches appear to be identical. I travel toward the Orangerie du Château de Sceaux (The Orangery of the Castle of Sceaux) to assist at a concert of chamber music, in a lovely spectacle hall. But my interest is attracted particularly by the guided tour of the gardens of the domain: gardens that are like embroidery! 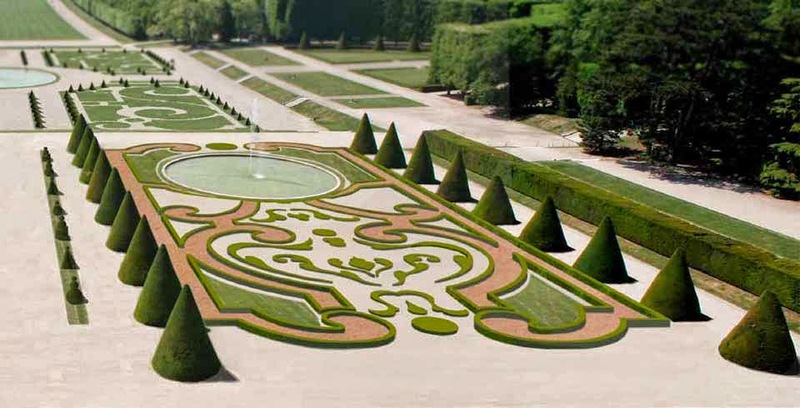 The famous gardener of Louis XIV of France was André Le Nôtre, the same who created the great gardens of Versailles under the reign of the Sun King. 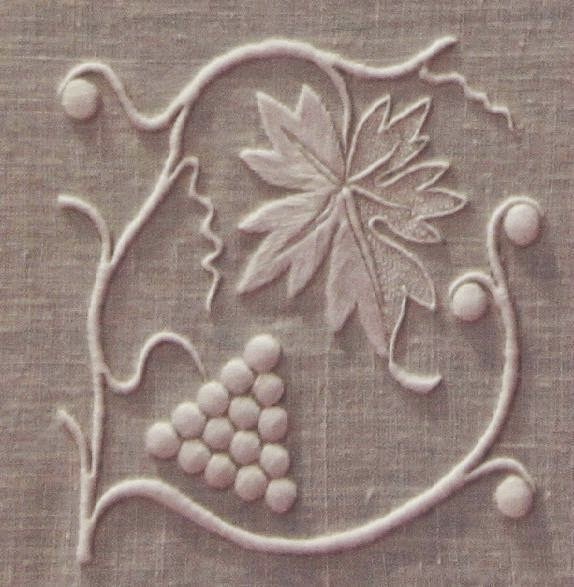 Le Nôtre was also an architect of the Nature and a lover of details, leading him to design true embroideries with bushes of box and colored gravel as basic material. Today, the project is to reintroduce those former Gardens of Embroidery on the immense Castle of Sceaux park. Bushes of box have been planted (a very resistant bush which doesn't need much care and grows at a low height) according to a design rich in curves and circumvolutions. Depending on the parterre zone, red, black or white gravel covers the soil. The final result composes an elaborated authentic embroidery pattern. Three hundred years ago those elaborated gardens were planted at the front side of the castle. This way, the building overlooked the park. André Le Nôtre was a master in the art of playing with the water basins and the planted area in such a way that an illusion of immensity was given. The year 2013 is the 400th birthday of André Le Nôtre and at this occasion, the Hauts-de-Seine region has decreed it The Year of Le Nôtre. At the Castle of Sceaux they celebrate by the project of restoring the grandeur of the past. I am coming back to Paris from a journey in the center of the country. I went to follow a Golden Work Course at La maison des Grenadières (we could translate this like: the house of the embroiderers of grenade patterns). First I had to reach by train the little city of Clermont-Ferrand, then I transferred for the village of Noirétable (a cute name that could be translated like Black-barn village), a more than 8 hour travel, a rather long travel. Every day La maison des Grenadières' director lady picks me up at my little hotel in Noirétable. We drive toward Cervières, no public transportation serving this hamlet. 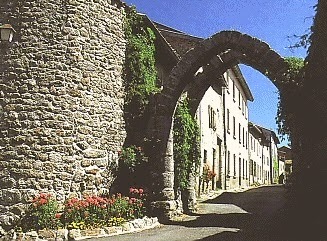 Cervières is a fortified village of 150 inhabitants, crowded with old tiny stone houses. The narrow streets allow only one car at a time. The village of Cervières has a long history. The little village was crossed by the Roman Legions and many centuries after by crusaders. Today, the village seems stopped on the time line at the Middle Age period. 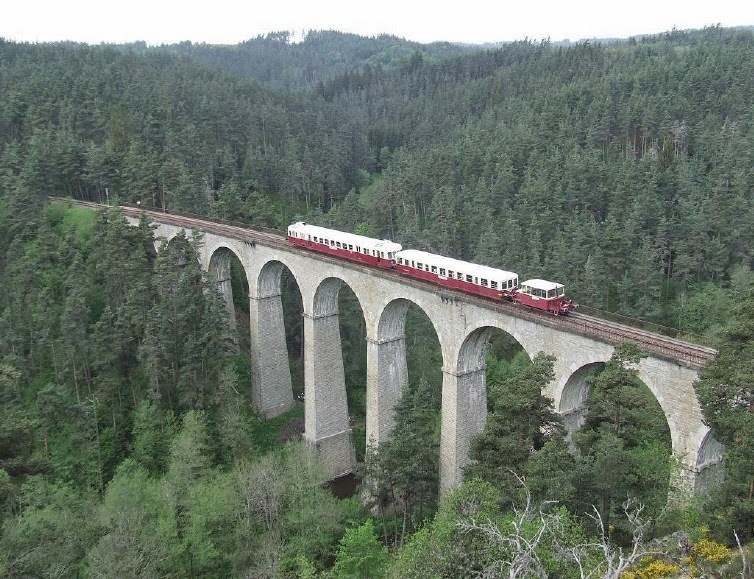 The landscapes of the region are breathtaking! The 3 floor buildinfg of La maison des Grenadières is located in the middle of the village of Noirétable. Four welcoming ladies work there. During my apprenticeship, every day we have picnic lunches, we enjoy yummy local products. La maison des Grenadières also hosts an historical museum about Gold Work Embroidery. Since 1886 the specialty of those craftswomen consists in stitching decorative grenades over policemen's uniforms and firefighter's uniforms. The stitched grenade represents an inflamed ammunition. The design dates from the reign of Napoléon I of France. 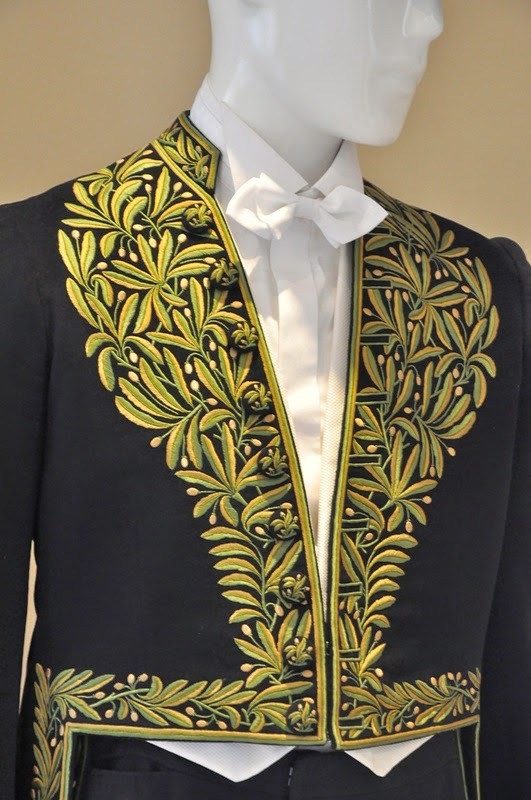 Over time, the professional embroiderers of Cervières and Noirétable stitched the motif hundreds of thousands of times. One can easily imagine the need for military uniforms during the two last World Wars. This was an important business activity, providing a good salary to the stitchers. In 1960, more than 500 embroiderers were employed for this occupation. Every family had its own embroiderer. Today, the Grenadières still adorn the Navy's uniforms, the Republican Guard's uniforms, the redingotes of the prestigious members of the Académie de la langue française. They also embroider for the Parisian Haute Couture designers. Here too the delocalisation of handcraft production harms the local traditional embroidery trade. But thanks to the institution of La maison des Grenadières, the precious knowledge isn't lost and the training sessions, such one I follow, can transmit this knowledge. As stitchers, dear readers, you might be interested in the kind of frame that the Grenadières use. This is a heavy and strong wood frame allowing to apply extra tension. Two very long screws are positioned on the left and the right sides. In the purpose of adding rigidity to the fabric, before embroidering, the textile is glued to some cheesecloth with simply a mixture of flour and water. Finally, a short word about the village of Noirétable. At night, the municipality administration turns off the street lighting. The intense blackness allows restful sleeping nights and magnificent skies enlightened by myriads of stars. I am the only client in the little hotel. I awake at the sound of the birds' song. And I spend the rest of the day at embroidery. These are true vacations for me. The photos of the beautiful things you shared are taking my breath away. Thank you for sharing this adventure!